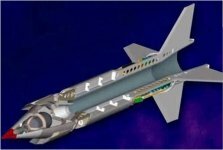 The Hypersonics Flight Demonstration program (HyFly) National Aerospace Initiative will develop and demonstrate advanced technologies for hypersonic flight. Flight-testing will be initiated as early in the program as possible and progress from relatively simple and low-risk tests through the demonstration of an increasingly more difficult set of objectives. Technical challenges include the scramjet propulsion system, lightweight, high-temperature materials for both aerodynamic and propulsion structures, and guidance and control in the hypersonic flight regime. The objective of the HyFly program is to mature the Dual Combustion Ramjet (DCR) hypersonic missile concept. Flight tests feature a missile configuration that is compatible with launch from surface ships and submarines as well as US Navy and US Air Force aircraft. Further development of HyFly to operational status will result in a weapon that could revolutionize our ability to rapidly respond to identified threats hundreds of miles away. Boeing, the prime contractor for HyFly, and GenCorp Aerojet, who will manufacture the engines, are developing the hypersonic strike missile demonstrator. The HyFly program is being performed by a team consisting of The Boeing Co. of St. Louis; Aerojet of Sacramento, Calif.; The Johns Hopkins University Applied Physics Laboratory in Laurel, Md. ; and Naval Air Warfare Center at China Lake, Calif. The engine is a dual combustion ramjet engine developed by The Johns Hopkins University Applied Physics Laboratory under ONR's Hypersonic Weapon Technology program. The ultimate goals of the program are to demonstrate a vehicle range of 600 nautical miles with a block speed of 4,400 feet per sec, maximum sustainable cruise speed in excess of Mach 6, and the ability to deploy a simulated or surrogate submunition. 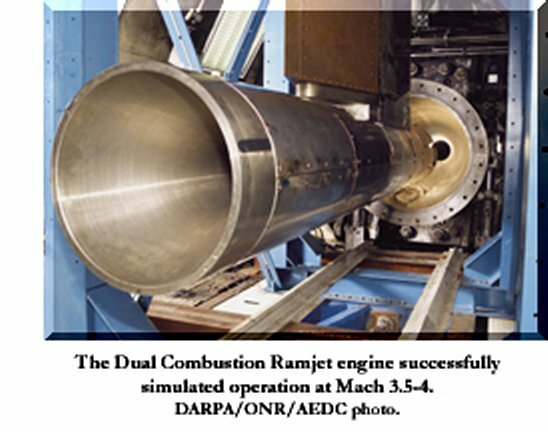 Recently demonstrated performance in ground testing of the Dual Combustion Ramjet (DCR) engine coupled with advances in high temperature, light weight aerospace materials are enabling technologies for this program. The program will pursue a dual approach. The core program will focus on development and demonstration of capabilities requisite for and operational weapon. A separate effort will be performed in parallel to demonstrate advanced propulsion technologies and develop low-cost test techniques. DARPA is negotiating with the Navy to establish a joint program to pursue areas of the hypersonics program that would be relevant to maritime applications. 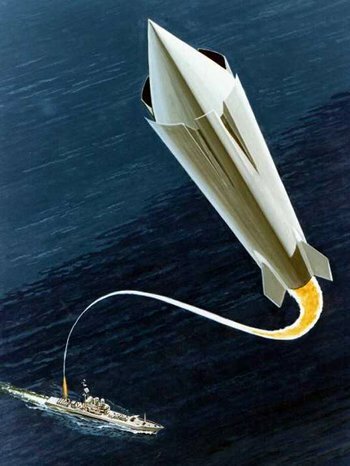 The Office of Naval Research (ONR) and the Defense Advanced Research Projects Agency (DARPA) successfully conducted the first ground test of a full-scale, fully integrated hypersonic cruise missile engine using conventional liquid hydrocarbon fuel on May 30, 2002. The test, performed in a wind tunnel at NASA Langley Research Center, Hampton, Va., demonstrated robust operation of the engine at simulated hypersonic cruise conditions (Mach 6.5 at 90,000 feet altitude). Demonstration of efficient supersonic combustion ramjet (scramjet) performance with a liquid hydrocarbon fuel is an essential step to enabling a viable hypersonic cruise missile. The 30 May 2002 test is the first demonstration of net positive engine thrust for a fully installed, hydrocarbon-fueled scramjet missile engine. Additional tests were conducted at the Arnold Engineering and Development Center, Arnold Air Force Base, TN, to verify operation at Mach 3.5 and 4 flight conditions, which simulate the hypersonic engine taking over following a rocket boost. In early 2003 Dual Combustion Ramjet engine testing at Arnold Engineering Development Center paved the way for Air Force and Navy officials to have a quick strike capability both services have been lacking. 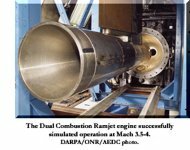 Putting the DCR engine through its paces, Arnold Engineering Development Center test experts marked the first time a fully integrated hypersonic cruise missile engine, using conventional liquid hydrocarbon fuel, was tested at critical flight take-over conditions. Tests were performed at AEDC's Aerodynamic Propulsion Test Unit for GenCorp Aerojet. The DCR engine, invented by experts at The Johns Hopkins University Applied Physics Laboratory in Laurel, Md., forms the basis for the HyFly hypersonic strike missile concept being developed through a joint Defense Advanced Research Projects Agency and Office of Naval Research hypersonic flight demonstration program. The tests provided critical data for developing the high-speed strike missile demonstrator, and APTU provided the unique capability to test the DCR at these conditions. AEDC was able to achieve a ground-test environment that matched flight-test conditions at air-breathing takeover and at Mach 4. Air-breathing takeover is the point after the rocket booster has accelerated the missile up to its maximum boost speed and the air-breathing engine powers the remainder of the missile's flight. A $10.4 million Military Construction upgrade enabling APTU to provide a virtual one-stop shopping for testing aerodynamic and propulsion systems from subsonic to Mach 8 was recently approved. The planned upgrade includes installing a new high-temperature and high-pressure burner that will increase test simulation capabilities with air pressures up to 2,800 pounds per square inch and temperatures up to 4,240 degrees Fahrenheit, providing the Mach 8 conditions. The modified facility will also support other types of testing besides air-breathing propulsion system tests. As of 2002 developmental flight tests of the HyFly demonstrator vehicle were to start early in FY04 with demonstration of a surrogate submunition deployment planned for March 2004. The program planned to progress to powered flights at Mach 4 in November 2004, with Mach 6 flights starting a year later. In the first flight test, conducted on 26 January 2005, an un-powered HyFly vehicle demonstrated safe separation from an F-15E as well as vehicle guidance and control functions. The Boeing Company (NYSE: BA), in partnership with the Defense Advanced Research Projects Agency (DARPA) and the Office of Naval Research (ONR), successfully demonstrated boost phase performance of a hypersonic strike demonstrator vehicle called HyFly on 26 August 2005. A Boeing F-15E launched the HyFly vehicle during the test over the US Navy's sea range at the Naval Air Weapons Center - Weapons Division at Pt. Mugu, Calif. The solid rocket booster successfully ignited and accelerated the HyFly to a speed of greater than Mach 3 - three times the speed of sound. This test was the second of five HyFly flight tests that were scheduled from 2005 to 2007. During the next three test flights, the HyFly vehicles was powered by a booster and a dual combustion ramjet, or DCR, engine at speeds up to Mach 6 -six times the speed of sound. After two flight test failures in 2007 and 2008 due to technical difficulties, DARPA added funds for an additional flight in 2010.